Haydock’s Betfair Chase is a recognised trial for the Cheltenham Gold Cup in March and has been dominated in recent years by trainer Paul Nicholls. The Ditcheat handler has won five of the last seven runnings, four of those with two-time Gold Cup winner Kauto Star. Last year it was Silviniaco Conti who continued the great record in the race for Nicholls and he is back again on Saturday. The race also heralds the return of this year’s Gold Cup winner Bobs Worth who is joined in the field by stable companion and 2011 Gold Cup winner Long Run. Nicky Henderson’s Bobs Worth only ran twice last season but won on both occasions. He began by beating Tidal Bay in the Hennessy Gold Cup at Newbury, a performance that established him as favourite for the Cheltenham showpiece. Some niggling injuries kept him off the course until the big race but he ran on powerfully to defeat Sir Des Champs, Long Run and The Giant Bolster. Henderson is very adept at producing his horses fit after a lengthy lay-off and he will be difficult to beat. His main market rival is Silviniaco Conti who was travelling well when coming to grief three from home in the Gold Cup. He had previously beaten Long Run in this race and followed up at Newbury. He was made favourite for his final start of the season at Aintree but was never travelling with any fluency and that run is best forgotten. 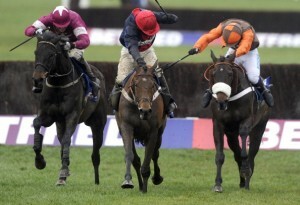 Trainer David Pipe saddled four winners at Cheltenham last Sunday and clearly has his stable firing on all cylinders. He is represented by the grey Dynaste, beaten at the Cheltenham festival in March but a clear winner at Aintree during the Grand National meeting. Dynaste missed his intended preparation race at Wetherby recently but is reported to be spot on for this race. Twelve-year-old Tidal Bay gives Nicholls a useful second-string having already won this season at Wetherby. That was over hurdles but he showed last season that he is equally effective over the larger obstacles. He won the Grade 1 Lexus Chase in Ireland but injury ruled him out of the Cheltenham festival and the Grand National. Ryanair Chase winner Cue Card is yet to show that he stays three miles but could be a dangerous opponent if he is allowed to dictate his own pace. He was slightly disappointing on his first run of the season at Exeter but can be expected to step up on that form here. Long Run turned in a dismal first effort of the season at Wetherby behind Harry Topper but reportedly scoped badly afterwards. He has since undergone extensive schooling and cannot be discounted having been placed in the last two Gold Cups. Irish hopes rest with Roi Du Mee who had some seriously good horses behind him when winning a Grade 1 at Dromore on his most recent start. Sizing Europe, Prince de Beauchene and First Lieutenant were all well beaten as he romped to a 13-length victory that day and he could be overpriced at 16-1 with Bet365. The Giant Bolster, fourth in the Gold Cup, completes a top quality field of eight for the Grade 1 race due off at 3.00.